In celebration of Asian Heritage Month, the Irving K. Barber Learning Centre presents a new exhibition of anthropologist and photographer Evelyn Nodwell’s photographs. 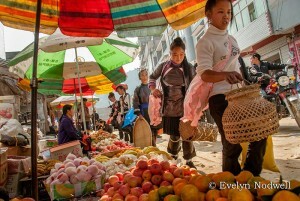 Nodwell’s images are an exploration of life in Guizhou Province, during a period of growing urbanization in China. As one of the country’s least developed provinces, access to Guizhou’s villages are accessible only over rough, winding and narrow gravel roads, or by foot. The photographs in this exhibition reflect the beauty and spontaneity of Guizhou’s landscape and its open and welcoming people. Nodwell was part of the first ever group of foreigners to visit one village, where residents were celebrating after the fall harvest. Rice is an integral crop and with fall festivals often being called Tasting New Rice Festivals, this body of work is an homage to a significant period for the province and people. “In the Season of New Rice” appears in conjunction with the 100th Anniversary at UBC Library. The exhibition, located in the Level 2 foyer, is free to attend daily. Evelyn Nodwell is an Anthropologist and Ph.D. graduate of UBC and has exhibited in Vancouver, Canada and in China. As an Anthropologist, Nodwell has worked in British Columbia and India. Based on her research in India, she produced two television documentaries in collaboration with Knowledge Network.